Managing something and mastering something are two different things. In the three steps above, we have not been trying to manage anxiety, or directly influence its length, strength, and frequency. Instead, we have been mastering how we live in the face of it. At the same time, no solution to any problem is black and white. Sure, a healthy diet is the key to weight loss . . . but what about regular exercise? The main way to lower anxiety is to stop it from managing us: to prevent it from controlling how we live and determining what we experience. But there are some effective ways to directly manage it. 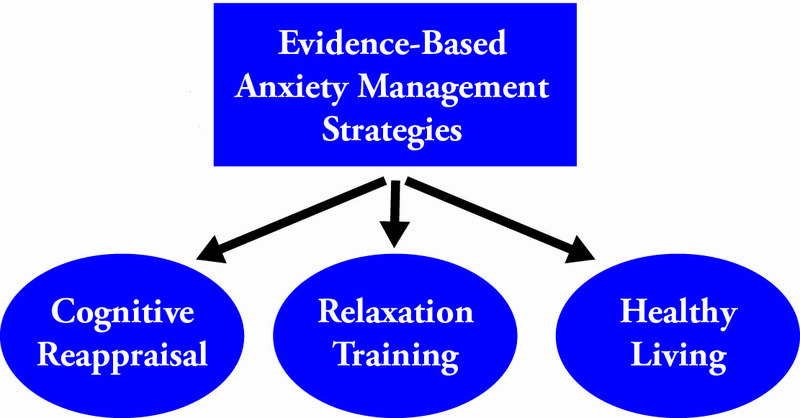 Aside from medication, effective anxiety management strategies fall into three categories. Let’s briefly look at each anxiety management category. Cognitive reappraisal. 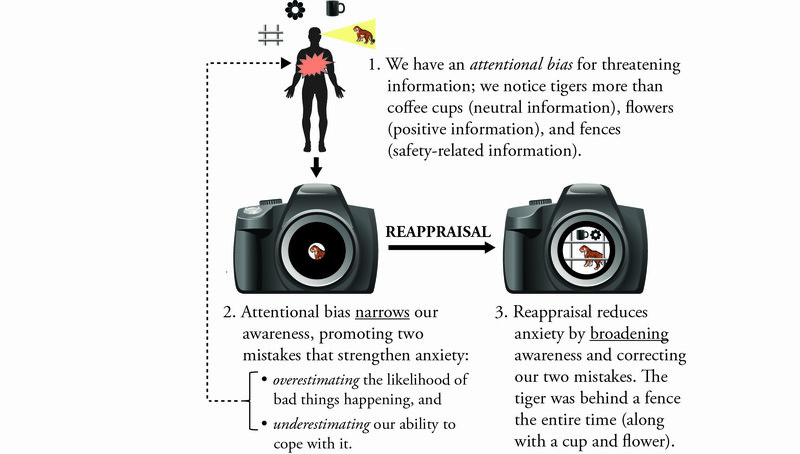 Reappraisal is a tool for managing anxiety by changing how we think. It helps us feel less anxious by adjusting anxiety-provoking thinking. 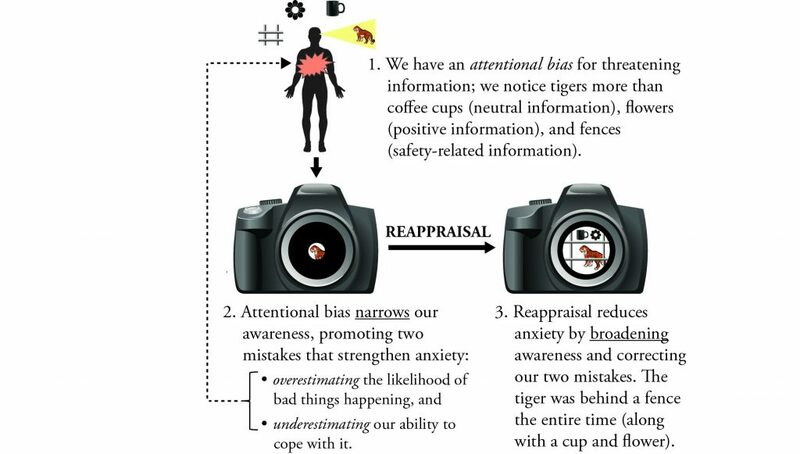 Notice how attentional bias creates two anxiety-fueling thinking errors by constricting our awareness. Also observe how reappraisal corrects these mistakes by broadening our awareness. We are not trying to eradicate anxious thoughts through cognitive reappraisal. We are striving to see the rest of it. Relaxation training. Picture stress as water in a bucket. The higher the water level, the more stressed we are. And the more stressed we are, the more likely it is that we’ll be anxious. Relaxation training is a way of managing anxiety by lowering the level of stress in our bucket. Hypothetically speaking, being stressed at an 8 might give us an 80% chance of feeling anxious. Dropping our stress levels to a 4 lowers our chances to 40%. Research particularly supports the use of two relaxation strategies: progressive muscle relaxation (PMR) and diaphragmatic breathing. Healthy living. We are probably all aware of the mind–body connection. The way we live affects how we feel. Our physical health impacts our psychological health. This presents another opportunity for anxiety management: Leading a reasonably healthy lifestyle decreases our tendency to feel anxious. Research shows that three lifestyle areas are especially important: sleep hygiene, exercise, and caution regarding the use of alcohol. Cognitive reappraisal, relaxation training, and healthy living — these strategies form the M in our CALM adjustment. True, courage is half the answer to most anxiety problems. But it is easier to face anxiety with courage when we know some ways to manage it.